One of the many things we love about farm life on the Yorkshire Wolds is witnessing the changes the seasons make to the beautiful landscape throughout the farming calendar. Whilst we couldn’t pick a favourite time of the year, “proper” winter weather, including a fresh dusting of snow, has to be a highlight, when coupled with clear blue skies and crisp air. After the relatively mild winter so far, we’ve been delighted to experience some of that proper seasonal weather this past week, albeit a small amount compared to some other parts of the country. 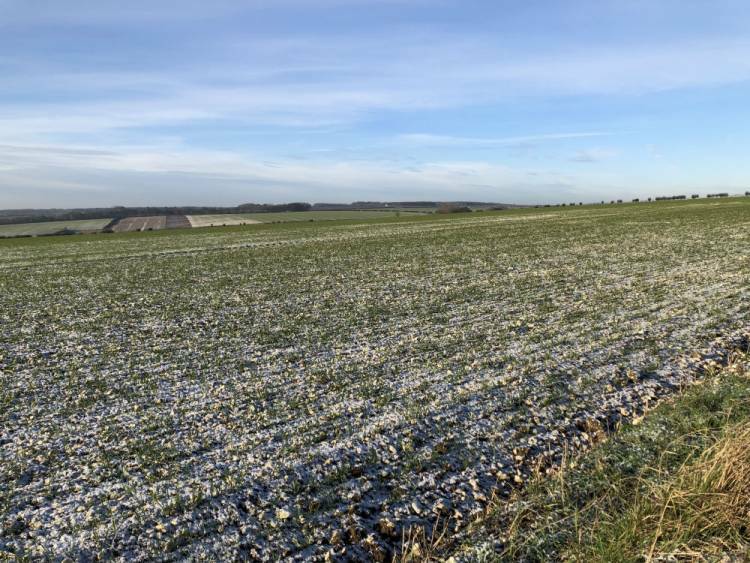 Aside from the fact that we get to see beautiful views like the one in our photograph (taken by Hilary on the farm a few days ago), a hard frost has other advantages for arable farmers like us. During a particularly cold spell, disease and pests that could cause problems for our crops in the coming months are killed off, giving us a better start to the growing season. Also, frost is great for the soil as it helps to break down the surface layer into a “friable loam”, which is ideal for sowing the spring crops when the soil is dry enough in March and April. Having looked at the forecast, it appears as though this cold snap is set to continue so let’s hope next time we share a photograph like this it’ll be “white over” as we say in Yorkshire!